Selven O’Keef Jarmon is a Houston-based fashion designer/visual artist. Inspired by a desire to incorporate social consciousness into his work, Jarmon moved to South Africa in order to channel connect his visual art space with the social, cultural and political climate there. 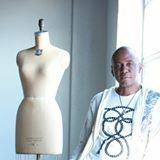 His work in South Africa includes master class training in haute couture clothing construction for community seamstresses in the Eastern Cape. Those classes are filmed and incorporated into the KWANDA Reality Makeover Show that aired in prime time on South African network television, viewed by over 14 Million people. Within the scope of the KWANDA television show, Jarmon founded the KWANDA Klothing Label, a collective of South African fashion graduates. Since moving back to Houston in 2010, Jarmon has continued the KWANDA Klothing Label and his visual artistry. His work was included in the Perspectives 144 exhibition at the Contemporary Arts Museum Houston, group show exhibitions at Pouissant Gallery, Deborah Colton Gallery's featured artist exhibition, and Neiman Marcus Dallas' Downtown Store Windows for the Dallas Art Fair.